After much back and forth, my decisions led me to a home staging class. That one class changed my life! Just a few short weeks later, Stage Right Home Staging was born. Since that time, Stage Right has grown from a few accessories in my basement to 2 warehouses with enough furniture and accessories to stage dozens of homes at a time. I've been blessed and privileged to have met and shared a stage with dozens of industry experts, who've all eagerly shared their knowledge and love of this relatively new industry to help us gain the amazing success we currently have. 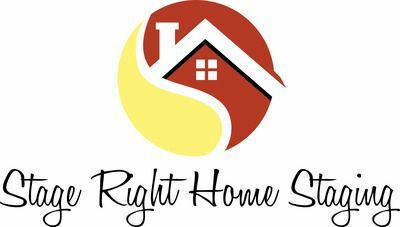 Stage Right Home Staging is a Full Service, Full Time Home Staging company. We believe that in order to excel, we must remain laser focused on our specialty - Home Staging. I dedicate 100% of my work schedule to ensure your home selling success and satisfaction without distraction to the end product - a meticulously staged home and a satisfied client. We are proudly 100% woman owned and run. To ensure our award winning tradition of Excellence in Home Staging, Customer Service and Industry Leadership, each of the staging professionals on our team have received specialized training, with a minimum of Accredited Staging Professional - the longest standing , NAR recognized designation in the home staging industry - and most of our stagers hold multiple staging designations! I thank you for taking time to visit us! Building Stage Right to the company it is today has been a labor of love and I am honored for the opportunity to work with you. I look forward to serving you with any and all of your home staging needs. If you're interested, more details of Stage Right's story is shared under my bio on the "Team" page.